Sometimes the measure of a young player who goes through a tough stretch is how they overcome the adversity and persevere to make the best of his opportunities moving forward. 2020 PG Bryce Hall (Mac Irvin Fire – Simeon Career Academy – Chicago, IL) will be the first to admit he wasn’t thrilled with his production during the spring, but instead of letting it affect him negatively, the tough season only drove him to work even harder to elevate his play in the summer events. That’s exactly what he did. 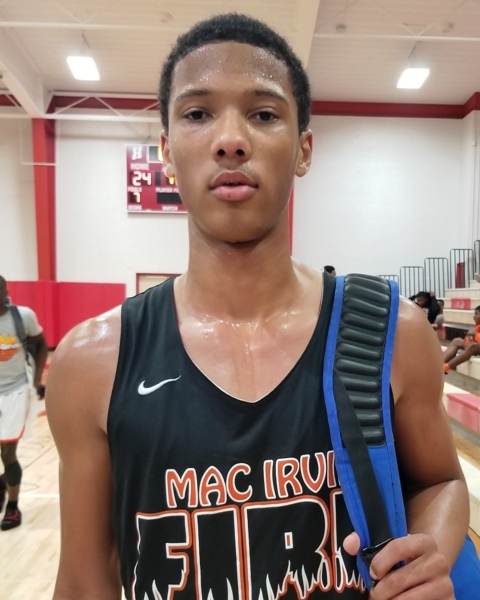 In the summer, Hall, a 6’4” 180-pound floor general led a talented Mac Irvin Fire group to a number of outstanding victories, and he really showed why he is one of the top point guards to watch coming out of the area this year. “The level of competition was always up to par so in my opinion, it helped me to develop… I believe I had a better summer than I did in spring, but I really finished well,” Hall said of his experience this past AAU season. Hall has good size and a good wingspan at the guard spot and has developed a solid skill set that is making him a very difficult player for opponents to defend. Hall himself briefly described his strengths as the ability to defend, score and lead his team. Again, with his length and improving athleticism/quickness, Hall really has an advantage against other guard with his size and ability to cover a lot of floor. He rebounds the ball well as a point, and offensively his outside game has come a long ways where he’s very consistent knocking down three anytime he gets a look. His vision is good and he does a nice job overall of getting the ball up to teammates on the break where they can use their athletic abilities to make plays as well. As the school year begins, Hall will go into the upcoming season knowing he has interest from a number of Division I programs. Bradley, Drake, Drexel, Florida Atlantic, Northern Illinois, Tulsa, UW-Green Bay, UW-Milwaukee, UAB, Valparaiso, and Western Illinois are the schools who have recently expressed their interest in the 6’4” point guard. Hall has already taken visits to Illinois (prior to the new coaching staff coming in) and UW-Milwaukee. The rest will come in time, and Hall knows he has to continue pushing himself to get where he wants to be. In the meantime, he is excited to get back on the court in games and showcase his talents under the bright lights yet again.